Just in case anyone wasn’t yet convinced that the BC NDP’s opposition to the carbon tax was pure political posturing, it turns out that a couple of years ago the BC NDP was in favour of a carbon tax… at least until it was proposed by the BC Liberals. The Sustainable BC report was originally drafted by the NDP Standing Committee on the Environment for an Ecologically and Economically Sustainable Future (SCOEE). 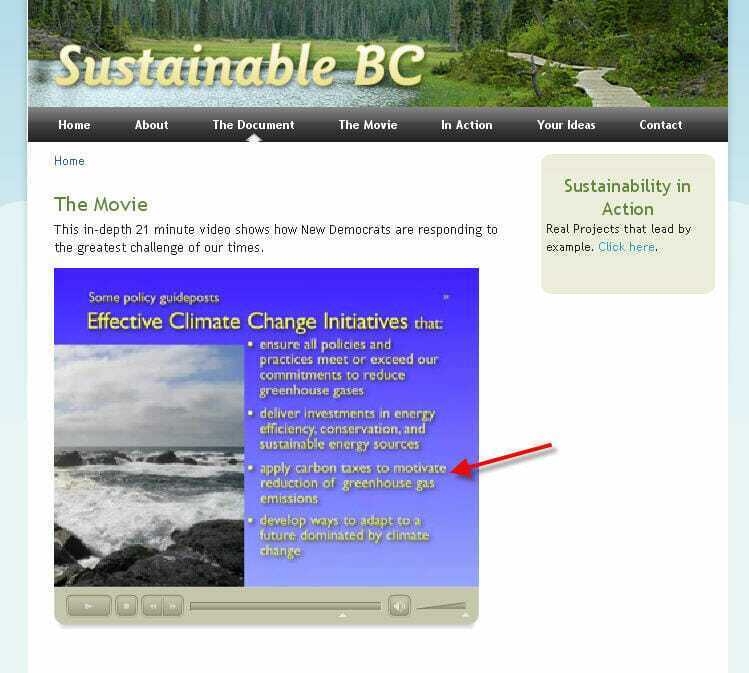 The scrubbed quote also lives on near the 16-minute mark of a video the NDP produced in conjunction with their Sustainable BC plan. I’m really uninspired by the politicking by the BC NDP on the carbon tax. I’m also angry with the BC Liberals. For the length of time they’ve had this tax, they’ve done what, exactly? The tax itself is the most ambitious plan they’ve had, and bothered to present. I’d rather our political parties speak about the ideas they have which would actually show our neighbours how to approach climate change. Carbon taxes and cap and trade programs do not work without actual concrete and ambitious goals. Hell, I’m so damn disillusioned by the entire political process that I’ve come to the conclusion that a goal like being a green province is actually a completely radical departure from the normal political theatre. It’s not reform we’re speaking of here – it’s revolution. A complete overturning of the carbon-based economy, which there are actually few political parties willing to champion. A ‘carbon tax’ and ‘cap and trade’ are actually far too conservative ideas. Standing behind one as the solution is a betrayal of principles, because we then become anchored to it, and politically marginalized. We cannot compromise. We need to give these pols hell, because the hell we’ll get by our inaction is a frightening prospect. The NDP has seen the light that a consumption tax is too harmful to the economy and those with less. Not to mention, that the USA is bringing in a cap and trade program with carbon tariffs. If we wish to continue trading with them, we need to be a part of it. This is the NDP’s outlook. As for the Liberals, the only environmental policy that they have is the gas tax and it is not very green. Otherwise, they are fully in favour of polluting the province for profit. As the Premier displayed on a recent trip to the NE. There is no reason why we can’t implement a carbon tax, and continue to trade with the US after they implement their cap and trade system. The trade tariffs that were talked about (though still a long way from reality) by the Obama administration, were to insulate American industry from foreign industry not subjected to carbon pricing. Given that the BC Liberal plan does a much better job of carbon pricing than the BC NDP plan, it is far more likely (but still ultimately unlikely, as that would likely depend more on what happens at the federal level) that the Obama administration will impose trade tariffs if we adopt the BC NDP plan. That is just a crazy assumption. Yes it is an assumption, but so was your statement that we need cap and trade if we wish to avoid tariffs from the US. And given what the Obama administration has actually said my assumption seems more reasonable than yours.